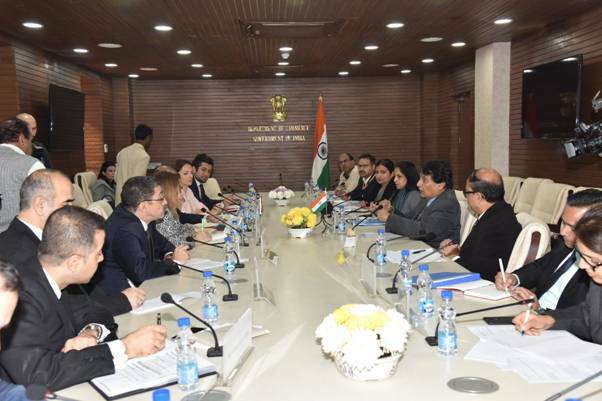 Hon’ble Union Minister of Commerce & Industry and Civil Aviation, Shri Suresh Prabhu, said that India will address all the concerns of Turkey, from agri products, banking issues, trade deficit and greater investments. The Hon’ble Union Commerce Minister said this during the bilateral meeting held with the Minister of Trade of Turkey, Ms. Rushar Pekcan, in New Delhi. During the bilateral meeting Hon’ble Union Minister of Commerce, Shri Suresh Prabhu said that he will lead a high level business delegation to Turkey in February next year and will work with his Turkish counterparts to make sure that all the issues being raised in the bilateral meeting by the Turkish side are addressed. The Hon’ble Union Commerce Minister requested the Minister of Trade of Turkey to organize the next India – Turkey Joint Committee for Economic and Technical Cooperation meeting as early as possible so that regular discussions on issues of concern between the two countries can be dealt with. The Hon’ble Union Commerce Minister, Shri Suresh Prabhu further said that India is excited to have a Comprehensive Trade Agreement with Turkey as early as possible. The Draft Joint Study Group(JSG) report, discussed by both countries in August 2018, needs to be finalized soon so that negotiations may begin. India has submitted its chapter to JSG and the Hon’ble Union Commerce Minister, Shri Suresh Prabhu requested Turkey to make their submission as early as possible. The Hon’ble Union Commerce Minister also informed the Turkish Minister that the proposal received from Turkey to deal in local currency is under consideration of the Finance Ministry of India. The Hon’ble Commerce Minister, Shri Suresh Prabhu informed the Turkish side that the Indian aviation sector is growing at 20%, which is the fastest growth seen in the aviation sector in the world. Hundred new airports will be constructed in the next ten years with an investment of USD 65 billion. He requested the world class Turkish construction companies to participate in the business of the growing aviation sector in India. Later the Hon’ble Commerce Minister also addressed India – Turkey business forum in New Delhi where he said that India is committed to make bilateral trade balanced and sustainable for both countries. Turkey is an important trade and business partner and both countries can benefit from each other. India-Turkey bilateral trade has increased significantly in the last one and a half decade. The major Indian exports to Turkey include medium oils and fuels, man-made filaments and staple fibres, automotive spare parts and accessories and organic chemicals. Turkey’s exports to India are poppy seeds, machinery and mechanical appliances, iron and steel articles, inorganic chemicals, pearls and precious stones and metals and marble. In 2017-18 bilateral trade was to the tune of USD 7.2 billion. Turkey’s imports from India during 2017-18 amounted to USD 5 billion and Turkey’s exports to India during the same period were USD 2.2billion. FDI inflow from Turkey from 2000 to 2018 stood at USD 182.18 million in areas like construction, glass and machineries whereas outward investment by India into Turkey between 1998 to 2017 has been USD 121.36 million.